Nothing like the quilts grandma used to put on her bed, the Firebelly uses modern materials and design to pack a lot of comfort into a light, small package. 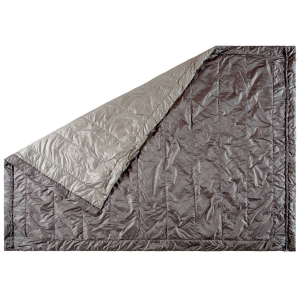 On the ground or in a hammock this quilt is great for those looking to reduce their three-season load in style. Low thirties and raining on a fall trip to N.H. Perfect weather for testing hydrophobic down. Kammok is an interesting company that seems to be balanced between being true gearheads and being more of what I’d call a lifestyle brand. Their website is full of information about their philosophies, but their gear is innovative in terms of materials and design. I’ll leave it to them to tell the rest of their story on their site, but it is worth checking out if you have a few minutes. For now lets focus on their Firebelly Trail Quilt. 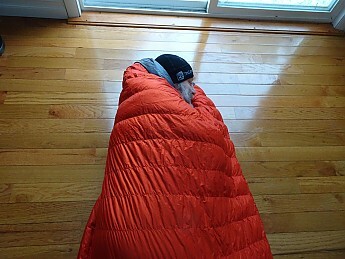 I like to start out sleep gear reviews by focusing on whether they keep you warm because that is job one of a quilt or bag. If you’ve ever slept cold you know nothing else is as important. The Firebelly is rated at 30°F and I found that to be a really accurate rating based on my experiences. There is an even heat distribution without cold spots or drafts. Wearing standard, light sleep layers (Light base under light fleece top, fleece pants, thin wool sleep socks) I found myself perfectly cozy at the 30°F mark. 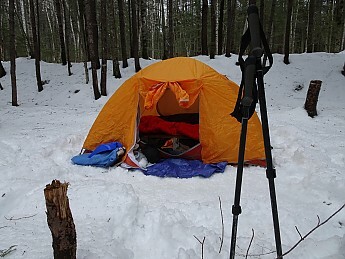 Comfort fell off rapidly from there as temperatures dropped below the quilt’s intended range. Stuffed, but not over stuffed, into its carry bag the Firebelly packed easily. 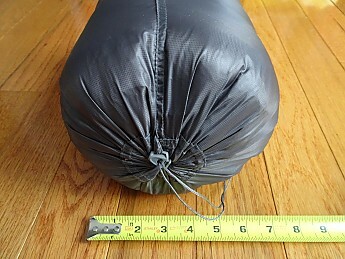 The Firebelly easily packs down into the roughly 12”x6.5” stuff sack it came in. Weighing in at about 23oz/652g it is easy to carry. Taking it out of that bag gives the 750 fill Downtek a chance to do its stuff. From first use to last the quilt has shown a rapid and complete lofting. The design of the quilt seems to allow the down to loft without needing the quilt to become what I’d call puffy. 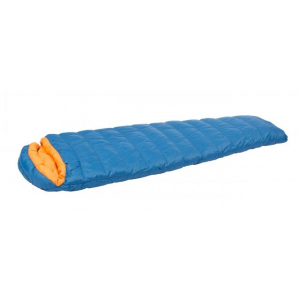 This somewhat low profile allows the quilt to work well under an overquilt or in other confining spaces. Wide enough to have plenty of material along the side to wrap around the whole body. Measuring 80”x55” when laid out completely flat the Firebelly provided great coverage for my average height and stocky frame. When configured with a footbox there was still ample material for me to pull up over my shoulders. There was plenty of width to wrap fully around even when side sleeping. Wrapped around the shoulders with plenty of room for the down to remain lofted. The materials used for both the interior and exterior of the quilt feel soft enough against the skin. The ripstop nylon is durable and water repellent without feeling course or rubbery. There also is a good heat distribution, possibly due to some design features we’ll look at later. Whatever the cause, the even sense of warmth really creates a sense of comfort. 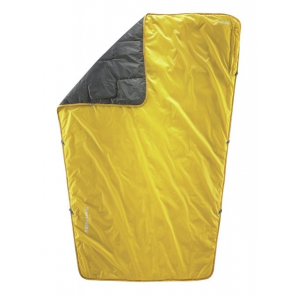 This is an area where Kammok’s gearhead side comes through with some use of materials and design that really shines. They start with a proprietary ripstop nylon fabric they call Atmos which they claim has heat reflective qualities as well as great durability. Inside they employ Insotect Flowgate design to keep the down well distributed. While Kammok didn’t employ Insotect’s vertical baffle design the gates do seem to prevent the insulation from puddling at one end of the horizontal baffles. Lit from behind by bright sunshine you can see the down remains well distributed even when hung vertically. There is some minor clumping in a few spots but they are the exception and tell me the quilt is probably due to be washed. Sewn with boxed baffle tubes as opposed to a sewn through Bavarian style the down has room to fully loft and expand. 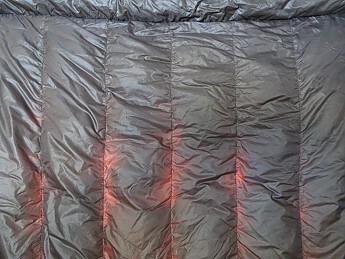 With no angle or shingling of the tubes the insulation works well up to the 30°F rating, but is not designed to retain enough heat to take this quilt lower comfortably. Using Downtek water repellent down adds confidence to using natural insulation in wetter environments. Hot and humid or cold and rainy, dry down lofts and insulates. Using hook/loop rather than buckles seems simple, but they can catch on clothing. There are drawstrings at both the head and foot of the quilt. Cinching the foot tightly creates the start of a footbox. It catches well on toes or pads at this point, but can be extended by using attachments points along the edge of the quilt. 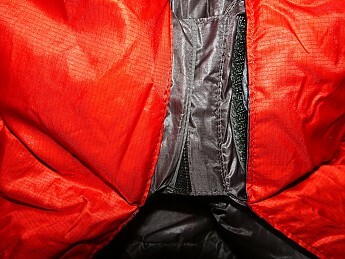 These are hook and loop flaps that normally are tucked away into pockets and provide a reasonable amount of attachment. These continue every 12" and can be used to create a full, but narrow, bag of sorts if all are used at once. These straps really kept a pad in place well, but I'm not sure I was using them correctly. 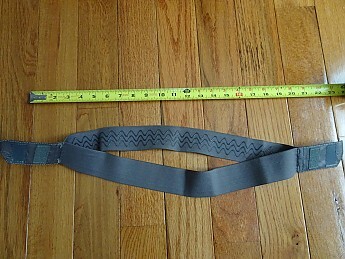 Kammok has an interesting pad strap designed to be used with the Firebelly. With bands that wrap entirely around the pad lined with gripping material they attach to loops in the pockets mentioned above. Well, at least I think that is the idea. My test quilt has the loops on one side but not the other so I used it that way. It worked well enough, if counter intuitively. I was expecting it to attach on both sides and am still not sure I was using it right despite finding it useful enough. 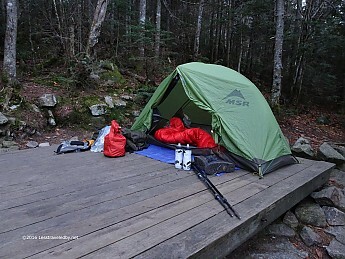 Waking up on a cool morning at Liberty Springs ready for a day on Franconia Ridge. I received this quilt during the summer and used it on every trip from then until late December. Conditions ranged from hot and humid to wintery snow. Trips were primarily in Maine and New Hampshire though Vermont and New York were also visited. Kammok, as you might guess from their name and product line, comes at things from a hammock perspective to some degree, but that doesn’t prevent their Firebelly Trail Quilt from doing a great job on the ground. As a longtime ground quilter I found it worked well for me as a three-season quilt here in New England. I don’t claim to have much hammock experience, but I set one up in the back yard to try the quilt in there and liked the way that felt too. Unlike my Therm-a-Rest Ventra which felt a bit squished in the hammock, the Firebelly felt like it had no problem lofting there. 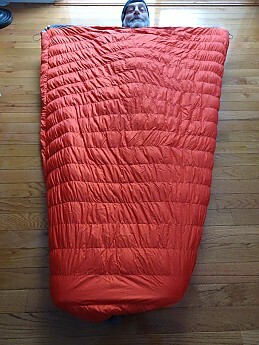 In warm weather the lightweight, low profile feel of the quilt made it easy to push it down around my ankles until I needed to tug it up as the evening cooled. On cooler nights the down stayed lofted even as I tossed and turned as side sleepers are cursed to do. Once warmed up it was a very cozy quilt, but it did lose stored heat quickly. A late night nature call in cooler weather meant having to rewarm the down, though that is a quick process in this quilt. The water repellent down combined with the Atmos fabric kept this quilt functioning well in wet conditions across the temperature spectrum. From summer thunderstorms, to cool Fall rain and even a four-day winter outing, the Downtek lofted and warmed to great effect. The hook and loop attachments along the edges are an interesting design that has some promise, but hopefully will continue to evolve. I like the idea of being able to attach without hard clips or buckles. Unfortunately there were times when my socks or pants would snag on the hooks by accident. Over all I was really impressed with this quilt. The Firebelly was warm when it needed to be, yet small enough to get out of the way when packed or crammed at the bottom of my tent on a hot night. 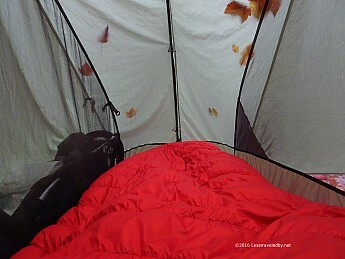 I often tent with the fly off when rain isn’t forecast as I like to enjoy the night sky. That leaves me susceptible to cool breezes in the wee hours of the morning which will really make it clear if you have gaps in your insulation layer. I found that the Firebelly did a great job in those conditions as breezes did not find their way through. Taking the 3-season quilt into the 4th season with my EE Prodigy as a top quilt. I also liked the way it worked under my EE Prodigy on a cold weather trip. There was no issue with down not lofting under the weight of an over quilt. 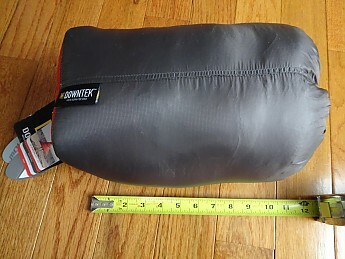 The only claim Kammok makes that I can’t support is to use this thing inside the house. We tried it one cold night and found it was way too hot to sleep under. 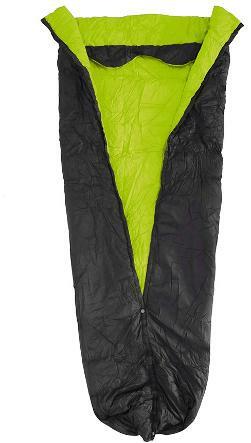 With a $299 price the Firebelly costs enough to be competing with custom quilt makers such as Enlightened Equipment. Looking at their site a 30°F Revelation quilt in standard 54" width with superior 850 fill Downtek currently prices out at $255, though there is an order backlog meaning you'll have to wait for a few weeks. The Kammok offering might look better on the couch, but you are paying for added style rather than function here. Bottom line is while there might be some room for design improvements related to the attachment points, this quilt definitely works well. I especially liked the warmth without the need for a lot of room to loft, which I suspect may be a hammock thing, but is just as useful on the ground. 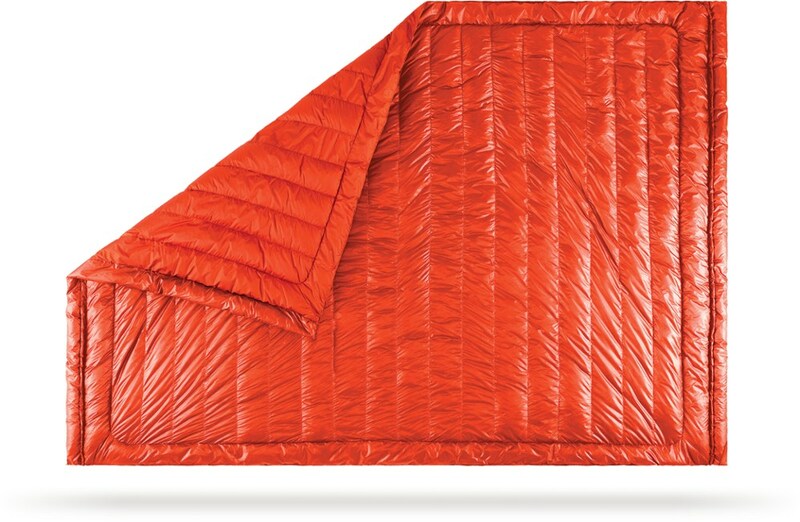 For those considering the move to a quilt or just looking to add another to your quiver, the Firebelly is definitely worthy of consideration. Those looking for pure functionality will probably find other options a better investment, but don’t be fooled by this quilt’s pretty face. Months of real world testing have shown me this quilt is no toy and certainly a joy to curl up under on a cool night in the mountains. Nice review as always. I agree the warmth to price ratio is quite high. 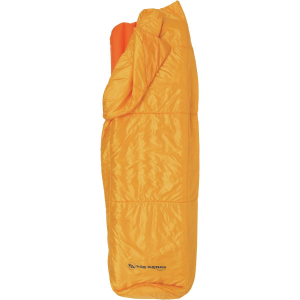 Especially when you can get full 15F sleeping bag for $200. Yes, great review, LS! Thanks for giving this quilt thorough testing and letting us know how it worked out.